Happy summer, readers! What are some of your favorite summertime traditions? I love having time to read, being able to go out in the sun (to read! ), and taking trips with the family (whether it’s to Florida or a local attraction, like the Cleveland Zoo or Akron Zoo). But probably my most favorite thing about summer is Discovery Channel’s Shark Week! Fun fact: long before I wanted to be a teacher, I wanted to be a marine biologist. I just love the ocean. I love being at the ocean, and I love all the things that live in the ocean. Yes, even sharks! Will I ever be brave enough to come face-to-face with a shark? Probably not, but I love seeing them on my TV screen every summer. I don’t just watch Shark Week. I binge-watch Shark Week. And I don’t just obsess over Shark Week when it’s on. I scour the Internet to find out the Shark Week air dates, what shows I’ll see on Shark Week, and how I might enhance my Shark Week experience. Have you seen those shark attack drink recipes, like the Food Network Shark Attack Punch recipe? I don’t drink alcohol, but I might just have to find a virgin recipe for these awesome drinks! Shark Week 2018 premieres next month on Discovery Channel. This will be the 30th anniversary of Shark Week. I’m so excited! If you’re a Shark Week-aholic like me (or just a fan of sharks in general), this post is for you. Keep reading for shark fun facts and a free shark printable! I’ve learned lots of shark fun facts from Shark Week over the years. Check out these 10 shark fun facts to tide you over until Shark Week 2018 premieres on Discovery Channel next month! Tiger sharks are nicknamed the “garbage cans” of the sea. Why? Researchers have discovered odd objects (such tires, gasoline tanks, and license plates) inside of Tiger sharks’ stomachs. Hammerhead sharks’ oddly shaped heads aren’t just for show! Their heads (called cephalofoils) are equipped with electrical sensors, which make Hammerheads superior hunters. Some species of sharks can swim in both freshwater and saltwater. One such species is the Bull shark. Bull sharks are often found in the Mississippi River. Fear of sharks increased when the movie Jaws was released. For every human killed by a shark, humans kill two million sharks. Bee stings and lightning strikes kill more humans than shark attacks. The Mako shark is the fastest shark, clocking in speeds up to 60 mph. Sharks are known for their teeth, but did you know that they also lose a lot of their teeth? Some sharks use up to 30,000 teeth in their lifetime! Great White sharks are the largest predatory fish (growing from 11-21 feet long). However, they are not the largest shark. The Whale shark is the largest shark, growing 18-33 feet long. Sharks do not have a single bone in their body. Their bodies are made of cartilage. People in Fiji and the Solomon Islands believe that sharks are possessed by spirits of dead ancestors. Have any shark fun facts you want to share? Drop me a comment! Guess what? I learned how to make word cloud art! 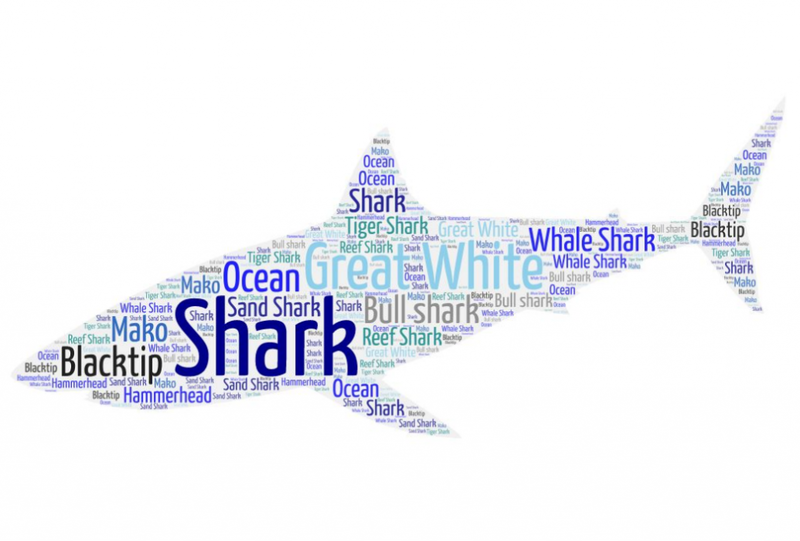 I put together this shark word cloud art for you shark lovers out there. Click the link below the photo for your free shark printable! Need More Sharks in Your Life? Check Out These Shark Toys! Check out my review post about Wild Republic’s stuffed shark line and Alex Brands DIY Knot-a-Shark blanket for more shark related fun! Good to learn more about sharks, spreading awareness is good. Kids will really love this. Sharks have jumped the shark. But I will always love Mr Hooper. Farewell and adieu my fair Spanish Ladies…. Not to much to it. I think it should be more fun the a bunch shark type names within a shark. Perhaps, make silhouette of each type of shark than a list of each type of shark than a separate list of each correct answer that shows the silhouette. Let me know if you would like further clarification. Knot – a – shark is cool and the fun facts is good too. I know kids will love it! Fun facts and I love your “word cloud” printable–really cute! These are great! Thanks for sharing them,I love sharks! My daughter does too! She looks forward to shark week. Many fun ideas for my nieces and nephew. Thanks for sharing. Thanks for stopping! I think they’ll enjoy learning more! Very interesting facts! Thanks so much for the cute printable! You’re welcome! Thanks for stopping! Wow. I sure learned a lot of interesting things about sharks! 30,000 teeth in a life time?! That is hard to imagine! Brilliant ideas and tips, thank you! This is such fun information! The printable is great! I love all of the fun shark facts–really interesting! The printable is so creative too! Thank you! My daughter is really talented! If I lived in Fiji or the Solomon Islands I’d hope I never did anything to make my ancestors sore at me. I hope not too lol. I didn’t realize that there were that many different sharks. This is an awesome activity for young and older alike. I enjoy Shark Week! I was surprised to learn there is a reason for the shape of a hammerhead shark’s head. Yes, it’s amazing how much you can learn! I didn’t know that tiger sharks are nicknamed garbage cans of the sea. Thanks for all the tidbits about sharks. I love your printable! Shark Week is highly anticipated in this house. Of my 4 kids, the youngest is the biggest shark fan, but the next to last is the shark info fanatic. Your fact #10 was completely new to us! Thanks! That’s awesome! You learn something every day! I love these ideas. Sharks are awesome. Thanks! I’m excited for this week! These are all great ideas!!! We loves sharks, and shark week, On this house! What kid doesn’t enjoy fun facts like these. I love that Shark Attach Punch idea–festive! Yes! We need to make some! 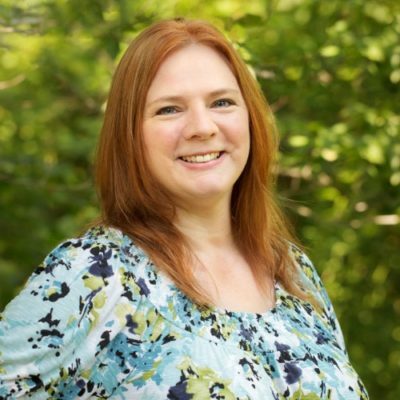 I’m an animal lover and thought I knew a lot about sharks…I barely knew 2 or 3 of your sharks fun facts, so thank you so much for sharing…They’re incredible animals, but I would never want to find any species nowhere near me! I’ve been a fan of Shark Week for 2 years now and my summer does not completely start until that show! Yes, I wouldn’t want to be near them, but they sure are amazing! Like the pinterest shark photo. Great tips and ideas, Thank you. I love sharks. I wanna swim in the ocean blue, just not with Jaws. Some creative ideas here. My favorite is the fun facts. I love, love, love this post. Totally pinning this. Great, thanks! We’re loving shark week! LOL I can imagine that too! LOL oh no! Yes, bees definitely can get you! I used to walk barefoot all the time, so I’ve had many stings! I love these Shark Week ideas! Everyone should learn more about sharks, they are amazing. Awesome printable, thank you. Sharks always get a bad rep but I think they are lovely! Great shark facts. I love shark week! Awesome Shark Printable! I love shark week! My girls do too! They have been checking out all the shark books they could get this week at the library. I didn’t realize bull sharks could withstand fresh and salt water. So neat! I had no idea that sharks have no bones! The shark week printables are a good idea for shark fanatics. Thank you for these amazing facts about one of nature’s most misunderstood animal. I like the shark facts. Shark week is a fun way to learn about them. I wouldn’t being able to have more than 2 sets of teeth just like a shark to regrow. Oh, well. That bull shark fact was a pivotal plot point in the movie Red Water (which was better than it had any right to be). Ever since I saw the Jaws movies, I became interest in them. I was pregnant with my first baby when the first Jaws came out. I remember some of the reviewers warning people not to go see it if you were pregnant or had heart problems! And it definitely not for children under 12! I remember people screaming in the movie theater. There has to be some sort of respect when it comes to a monster like that! Sharks are coming closer and closer to the shores! As a matter of fact, there was a shark attack in Florida not to long ago. Knowledge is power! Learn and stay safe! Thanks for the printable. Your welcome! What a great story! I know now kids today would probably joke about how fake it looked, but back then, that was the big time! I love these and Shark Week! Love the photo. It would be great for the classroom where I teach now. Lots of great info on sharks. Can’t really say I’m a fan – more scared of them than anything. I remember when Jaws was released. I did not watch it (and still have not, saw just clips). My friend went and whenever we went boating that year she was anxious. She still went, probably because there are no sharks in Central Wisconsin. My boys will like learning all of these facts. This was interesting to learn: For every human killed by a shark, humans kill two million sharks. Bee stings and lightning strikes kill more humans than shark attacks. The punch recipe looks and sounds really good. Sounds like a lemon lime rock candy good time! This is so neat! I love the facts & the shark week printable! So cool! I love learning about sharks. Lots of great info, thanks! Love shark week and you have some good stuff here. i like the shark printable. i was just at a birthday party with baby shark themed candies and cake. My grandkids always like learning about sharls and other animals. They are very cool and I know that my son will think so too. These are some really cool shark facts, thanks for sharing them! I’d definitely believe fear of sharks increased after Jaws. That movie scared me to death, lol. My youngest nephew would love that shark printable with all the sharks listed. No doubt he’d be reciting them, lol. Wow the Mako shark can go as fast as 60 MPH not that is really fast for a shark . Better get outta there FAST. I do too! I dream that I am at the beach but there are too many sharks to go in! Kids are always interested in learning about animals . We visit the Baltimore Aquarium many times. Still remember the sound track to the song they played in Jaws. Yes. 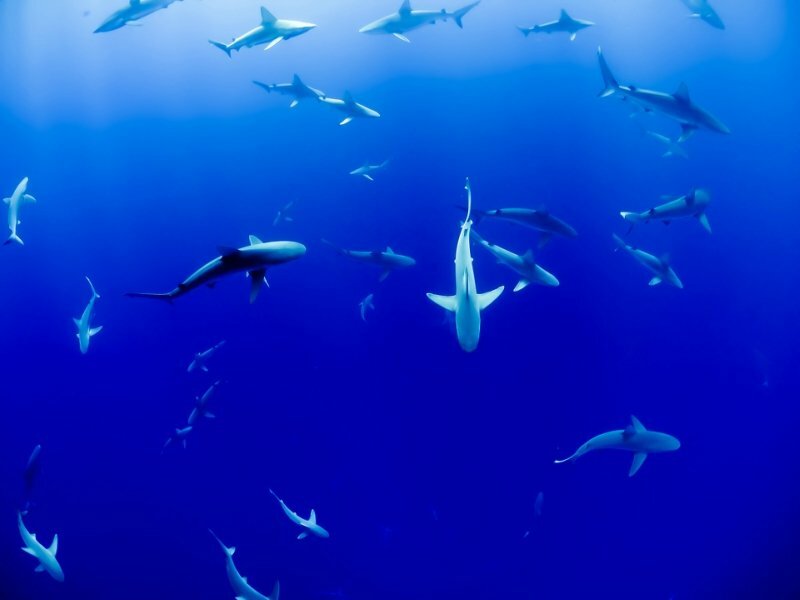 Sharks can be dangerous, but they are so sleek and have so many different kinds. I’ve seen shark tooth necklaces and have eaten shark in the past from the grocery store. A very educational posting with great pictures also. Nice for the grandkids too. Awesome printables! I would rather sharks be the predators than giant squids which will happen if they get wiped out. Now that’s scary. There’s a lot of information there that I did not know about sharks. But then, I don’t like sharks so I don’t often watch any shows about them or even read much about them. Very interesting stuff……but I think you may have gone overboard Get it? Very Very interesting……But I think you may have gone overboard Get it? I did know about sharks having cartilage rather than bones. I’ve heard that scientists have studied it to see how it might help humans medically. Bee stings and lightning kills more people then sharks. I never would have thought that to be true if I wouldn’t have read it here. Awesome knowledge to learn about sharks. 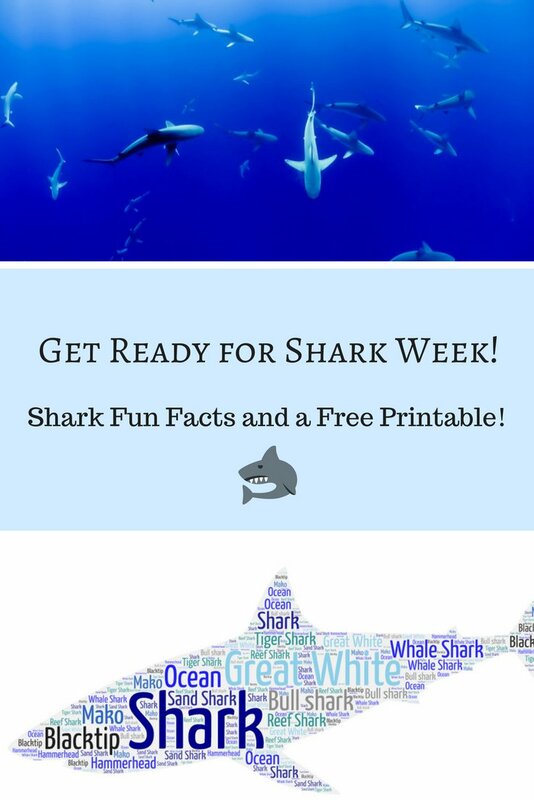 Really cute printables and great info on sharks!